We are very pleased to introduce our very own organic flower expert, Lyn Hicks. This is the first article in Lyn’s brand new organic flower series. She will be sharing interesting tips and advice on organic flowers to inspire and guide not only florists, but anyone who loves flowers and wants to make a positive “Green” contribution to our planet. My name is Lyn Hicks and I grow and design organic cut flowers in Pennsylvania, the eastern region of the USA. I specialize in Green Weddings and Events and am active in the Green Movement in my area. I am very excited to share my wisdom on organic flowers and hope to educate you on ways to enjoy nature’s wonderful gifts and how organic flowers and green choices can enhance your wellbeing! growing organically and organic flowers are readily available to us through many channels, including the internet. This higher quality product that was grown with the utmost care is the culmination of ethical floral design which provides us with a safer, healthier product for ourselves, our customers and the people who grow them. This is about wellness and making the most of our land. Grown with the intention to enhance its beauty throughout the entire process, is the essence of organic flowers. So wherever possible consider organic in your world and business. weddings as well as weekly flowers to businesses and homes. Bouquets with unusual accents and offerings, and whimsical designs inspired by nature are my specialty. I do not profess to be a designer of great flowers as many florists are. My expertise lies in using what’s available to me, I harvest what I grow and from there the flowers come together naturally for the celebrations they adorn. Many people, including florists grow their own selection of plants and flowers, so I will share some unique ideas and techniques with you in upcoming articles! often showcased this way. Using many different sized containers together on a table is the perfect design for the varying sizes and colors of these delightful flowers. Many are small, but don’t let this keep you from using them for this type of presentation. People love seeing them in displays because they are not the standard flowers in the industry. You can even grow wheatgrass in a container which is the perfect base for spring arrangements. The first colors of spring are purple and yellow, reminding us of the floral holidays around spring such as Easter and Mothers day, etc. Spice up your displays using common flowers that are growing around you in your area and not always available through a wholesaler or florist. This will add variety, freshness and uniqueness to your designs that will set you apart from the other florists! 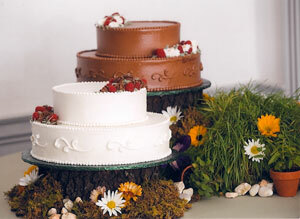 Stay tuned for my next article on Green Weddings and Events so you may capitalize on this growing market. If you enjoyed this article, please spread the word by clicking the “Like” button or sharing it using the share icons below. Want to read more articles like this? Then Subscribe to our Updates, and get our articles directly to your inbox or RSS reader. 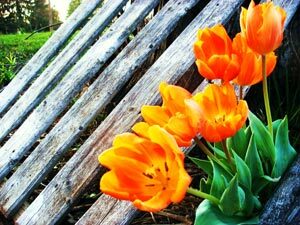 I have grown and arranged organic flowers for the last 6 years, and enjoy sharing tips and ideas on how to use your landscape to enhance your flower arrangements. I promote purchasing local as well as organic flowers because they are fresher and safer. Flowers are the gems of the garden, and connecting to where and how they are grown makes for a more holistic approach to creative design. You can visit my website at: www.harmonyhillgardens.com or follow me on Facebook and Twitter. Lyn Hicks has written 1 articles for us. I must admit you share a tremendous amount of information regarding that center. Personally i will take care of every single word that you had mention over here. Thanks for the post…and thanks for growing organic flowers. One of my favourite Spring flowers for decorating is violet! I make candied violets and bring them out in the Winter when it’s snowing and blowing and it’s like having a burst of Spring in the middle of Winter! Oh so lovely! Most people don’t know violets are edible! They are going crazy around here and they are perfect in ice cube trays to add some flowers to your drink! Candied they are yummy! 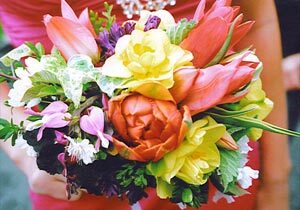 Brides in the United States can find great local flowers by visiting the Association of Specialty Cut Flower Growers website. http://www.ascfg.org. There are local flower growers in every region and state. Lyn: Some inspiring information! The next step–past promoting organic stems–is to simply get the consumer buyer better educated on how to care for their blooms. If they know how to properly trim stems and change the water in their containers–not to mention adding floral preservative–their blooms will last longer. And when their flowers last longer, then consumers will stop thinking of them as such a luxury and start buying them for “everyday” consumption. That will truly help the floral industry grow! Perfect Gina! You are right! Truly educating the consumer about flower care is an important part of my business! Thanks for that comment!